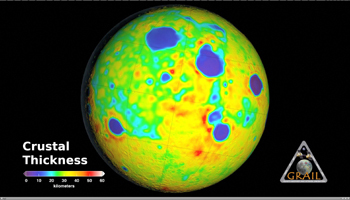 This animation depicting the crustal thickness of the moon was derived using gravity data from NASA's GRAIL mission and topography data from NASA's Lunar Reconnaissance Orbiter. The measurements match those found via seismic data at the NASA Apollo mission 12 and 14 landing sites, where crustal thickness is 19 miles (30 kilometers). There is a minimum crustal thickness less than 0.6 mile (1 kilometer) within the nearside Crisium and far side Moscoviense impact basins. The average thickness of the crust is 21 miles (34 kilometers), which is almost 12 miles (20 kilometers) thinner than values from previous studies. This animation starts on the nearside hemisphere and then rotates to show the entire moon. Regions of crustal thinning in blue are associated with several large impact basins several hundreds of kilometer in diameter. The far side differs from the near side by having a higher than average crustal thickness (in red).